Hairdryers are one of the most vital tools you can have for haircare. I don't normally post about beauty, but thought I'd try something a bit different. Here's a great choice from Panasonic if you're looking for a new hairdryer that isn't the Dyson but delivers similar technology. Lots of factors are to put into consideration - including wattage (important for your style of hair), different heat settings and what nozzles and accessories come with the dryer, so you get the best value-for-money. 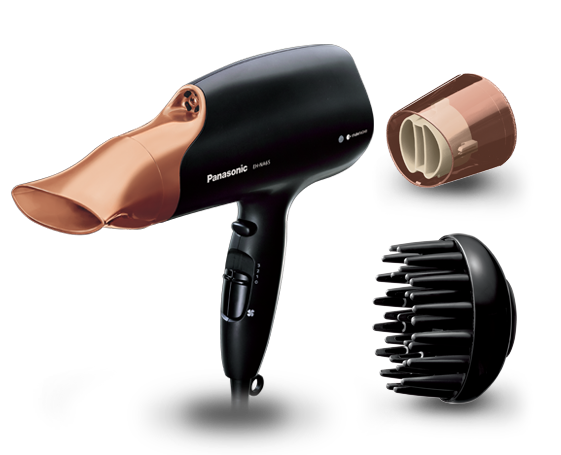 A great option is the Panasonic Nanoe Hairdryer* as it helps to reduce frizz and damage from styling tools. The Nanoe technology in this hairdryer means that it retains so much more of your hair's moisture than others, making your hair look really shiny whilst drying it, as well as looking beautiful in a rose gold colour. The video below explains what the technology does and how it benefits your hair. As well as looking great, it's also portable and quiet, so no-one can hear it if you want to use it during a hotel stay without taking up half of your suitcase. Another benefit is that it's fast-drying, meaning it keeps both scalp and roots healthy in optimum time whilst keeping your hair strong. Read the full spec if you would like. Buy the Panasonic Hairdryer with Nanoe Technology at Boots, Amazon** (where it's currently Amazon's Choice), your local Panasonic Store or Argos. I never thought of Panasonic being a brand for hair products, but will definitely look for this when it comes to choosing a new one, as the Dyson is probably a little bit out of my price range. *This post is sponsored by Panasonic. All opinions are my own. **I'm using an affiliate link, meaning I make a little bit of money from sales of this product on Amazon. Panasonic is goot at this job!